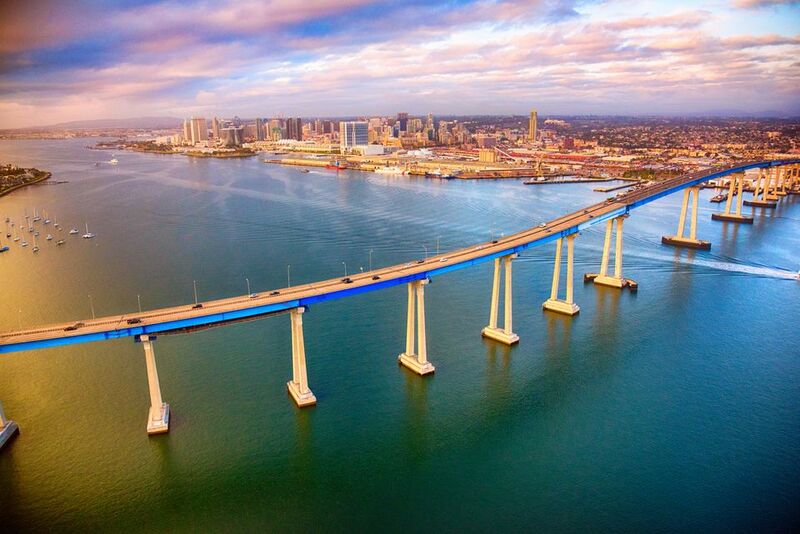 The San Diego-Coronado Bridge (commonly referred to as the Coronado Bridge) is a 2.12-mile bridge that spans San Diego Bay and connects the City of San Diego with the City of Coronado. It is the main way to access Coronado's beaches and the North Island Naval Air Station, as well as the Silver Strand isthmus that connects Coronado to Imperial Beach and the mainland. The Coronado Bridge can be accessed via Interstate 5 in the Barrio Logan neighborhood, just north of National City. It rises and descends in a sweeping curve that ends at Fourth Avenue in Coronado. Construction of the bridge started in 1967 and opened on August 3, 1969. Robert Mosher was the primary architect of the structure, which is made with orthotropic steel and has a thin, tubelike design for efficiency and grace. The structure uses the world's longest continuous box girder to conceal the braces, joints, and stiffeners normally visible in other bridges. Mosher says he designed the 30 arched towers after Balboa Park's Cabrillo Bridge. The opening of the bridge eliminated the longtime vehicle ferries that crossed San Diego Bay and provided quick and easy access to Coronado. The graceful and clean architecture and blue paint have made the bridge one of San Diego's most notable landmarks and symbols. Architect Mosher claims the 90-degree curve is by necessity—spanning long enough so it can rise to a height of 200 feet and a 4.67 percent grade, allowing even the Navy's aircraft carrier to sail under. In 1970, it received the Most Beautiful Bridge Award of Merit from the American Institute of Steel Construction. The Coronado Bridge cost $47.6 million to build. The former toll bridge paid off its construction bonds in 1986, and the $1 toll was eliminated in 2002. The bridge has five lanes of traffic and carries around 85,000 cars daily. The 34-inch-high concrete barrier railings are low enough to permit an unobstructed view, which includes the San Diego skyline, from vehicles on the roadway. The shipping channels are spanned by the world's longest continuous three-span box girder: 1,880 feet. The towers rest on 487 prestressed reinforced concrete piles. In 1976, the bridge was retrofitted with special rods to protect against earthquake damage. Under the roadway is a steel-mesh catwalk built to facilitate bridge maintenance. Caltrans conducts routine inspections to detect concrete flaking and exposed bare metal surfaces. It is one of the deadliest suicide bridges in the U.S., trailing only San Francisco's Golden Gate Bridge and Seattle's Aurora Bridge. Architect Mosher took a piece of string to map out the crossing points of the bridge and to determine the curve and the state requirements for the bridge, as the span needed to be a bit more than two miles long, making a straight path impossible. Painting the bridge is a never-ending job. A six-person crew works year-round to keep it protected from corrosive ocean breezes. The blue color was chosen to blend with sky and sea.